Curtains were drawn on the 2017 SAFF under-18 championship yesterday at the Changlimithang when Nepal lifted the trophy. 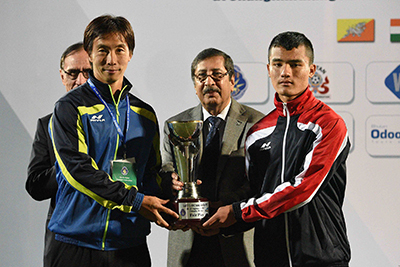 Bhutan did not leave the tournament empty handed as they were given the fair play award. 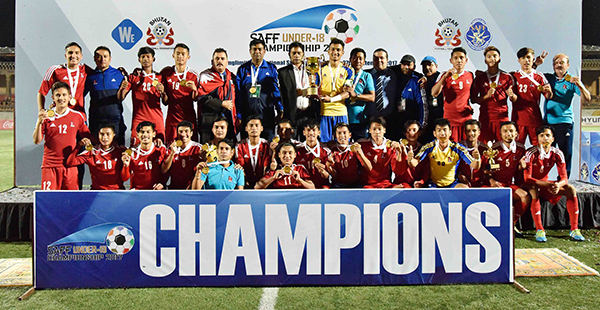 Jubilant Nepalese players celebrated with joy upon successfully defending the SAFF under-18 championship crown. They confirmed their win by defeating India two – nil in the last match of the championship yesterday. “First of all I would like to thank all my teammates because they worked hard and played very well,” said Arpan Karki, the Captain of Nepal U18. For Bhutan, what started as a promising adventure ended in disappointment when Bangladesh inflicted a 2-0 defeat. However, given Bhutan’s good disciplinary record in the tournament, the Bhutanese team was rewarded with the fair play award. Jafar Iqbal, the man from Bangladesh, who scored two goals against Bhutan, received the top scorer’s award for his tally of five goals in the tournament. The biggest individual prize, the most valuable player award, was given to Nepal’s Dinesh Henjan for his all round performance in the tournament. Bangladesh who finished second and India third were given silver and bronze medals respectively.